With unflinching candor, a moving graphic novel follows a young woman’s return from war and her bond with two dogs—one who saves her life in Iraq, and another who helps her reclaim it at home. Liz served in Iraq with her trusty military working dog, Ender, by her side. But now that her tour is over, she has to readjust to life in her small New Hampshire town. Despite being surrounded by people she’s known her whole life, Liz feels entirely alone and soon gets trapped in a downward spiral of flashbacks and blackout drinking. Things seem destined for a bad end, but when Liz’s on-again-off-again boyfriend, Ben, almost hits a stray dog while she is in the car, things start to change. Brutus might just be the only thing that can bring her back from the brink. Brian David Johnson, Jan Egleson, Laila Milevski, and Karl Stevens have created a searing and honest portrait of reentry to civilian life after war and a touching exploration of the bond between dog and human. Jan Egleson is an independent filmmaker and writer. Brian David Johnson is a journalist. This is their first book for young adults. They both live in or around Boston, Massachusetts. Laila Milevski is a cartoonist and illustrator whose work has appeared in the comic anthology š! and online in Comics Workbook. She self-publishes short comics, but this is her debut in a longer format. Laila Milevski lives in Somerville, Massachusetts. Karl Stevens is a graphic novelist and painter whose comic Whatever appeared in the Boston Phoenix for three years. He lives in Somerville, Massachusetts. 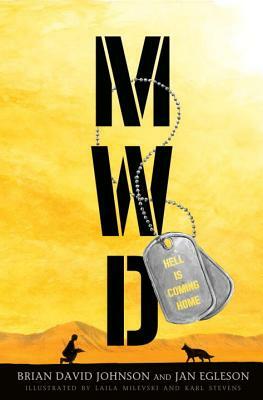 A gritty, hard-hitting, and honest portrayal of one young woman's difficult journey to putting the pieces of her life back together after serving in the Iraq War...The story's strong language, graphic depiction of war, and Liz's unpredictable behavior make this an emotionally taxing read, but the ups and downs also effectively give readers a sense of Liz's trauma. A nuanced and skillfully composed snapshot of one woman's postwar struggle to live. It does a good job documenting the struggles of coping with PTSD, and the female perspective of the book is a welcome change of pace.